A new report has punched some holes into arguments that mobile phones may cause cancer. "Although there remains some uncertainty, the trend in the accumulating evidence is increasingly against the hypothesis that mobile phone use can cause brain tumors in adults," researchers from the International Commission for Non-Ionizing Radiation Protection Standing Committee on Epidemiology concluded in their findings published late last week in the Environmental Health Perspectives journal. 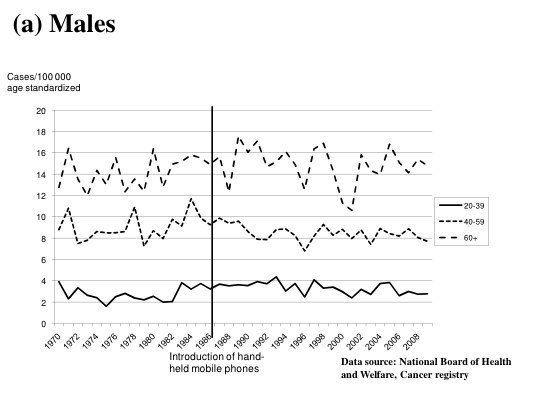 In the journal, the researchers released findings on brain cancer instances for males and females across different age categories both before and after handsets were released. They found that the instances of cancer have remained relatively static between 1970 and 2008. They also referenced other studies on the topic. "Methodological deficits limit the conclusions that can be drawn from [the] Interphone [study], but its results, along with those from other epidemiological, biological and animal studies, and brain tumor incidence trends, suggest that within about 10-15 years after first use of mobile phones there is unlikely to be a material increase in the risk of brain tumors in adults," the researchers wrote. The debate over whether mobile phones can cause cancer has been raging for years. In 2004, for instance, a Swedish research institute found that 10 years or more of mobile phone use can cause tumors to grow in humans. In 2007, scientists found that just 10 minutes of handset use can cause changes in the brain that have been known to cause cancer. The debate hit a tipping point in May when a division of the World Health Organization classified mobile devices as a "carcinogenic hazard." Exhaust from gas engines, lead, and coffee also have that classification. The World Health Organization had previously said it could not find a link between mobile phone use and cancer. Even in its most recent findings and classification, the organization acknowledged that it still could not find a definite link between cancer and mobile phone use, and said that more research was needed. The researchers behind the latest study also acknowledge that there is much more work to be done. They also noted that researching cancer risks, especially in children, can be difficult, since data "for childhood tumors and for periods beyond 15 years are currently lacking." But according to the researchers, at least for now, evidence is piling up that handsets do not appear to cause cancer. Number of cases of glioma--a type of brain cancer--per 100,000, according to the National Board of Health and Welfare in Sweden. 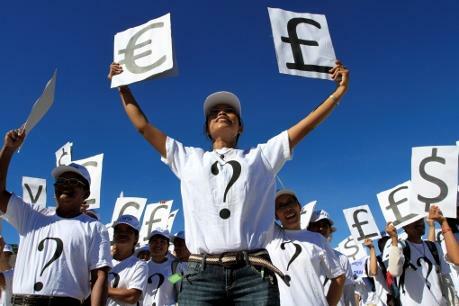 Climate Conversations - Have countries delivered on fast-start climate finance? As the reporting deadline for 2010 looms, developed countries will need to prove that they are honestly meeting their modest $30 billion commitment. WRI has released an updated summary of developed countries’ “fast start” climate finance pledges. These funds are intended to help developing countries reduce emissions and adapt to climate change from 2010-2012. To date, 21 developed countries and the European Commission have publically announced individual fast-start finance pledges totaling nearly $28 billion to meet the $30 billion commitment in the 2009 Copenhagen Accord. In last year’s Cancun Agreements, developed countries reaffirmed their commitment and also agreed to provide greater transparency on the delivery of their pledges – in other words, information not just on what the pledge is, but on how the country plans on meeting it. The timing of this information is crucial as developing countries await progress in this area before moving other pieces of the Cancun Agreements forward. For example, major developing countries – Brazil, China, India and South Africa – have explicitly linked progress in the Green Climate Funds discussions to the sizeable flows of fast start funds. Developed countries are invited to voluntarily provide this information in annual reports to the UNFCCC Secretariat in May 2011, 2012, 2013. Unfortunately, the Cancun Agreements contain no specifics on what format the reports should follow. With the May deadline looming, what do we already know about what developed countries are providing? Our updated summary presents the most up-to-date information available. The summary reveals that most developed countries are making tentative progress towards delivering their commitments. However, the information available is neither complete nor consistent, and developed countries should provide comprehensive and comparable information on the delivery of fast start finance in 2010 in the reports they submit this month. Some news reports have suggested that developed countries have “missed” the May deadline for reporting. This is based on the May 1 deadline specified by the secretariat. However, since the Cancun Agreements do not actually specify a particular date in May, countries are not obliged to provide information by May 1, and could reasonably be expected to submit their information by the end of May. WRI is aware of several countries that are working on preparing these reports and we expect to see submissions fairly soon. It is important that they all meet the May deadline in the Cancun Agreement, and submit comprehensive and comparable reports and be completely transparent about underlying assumptions behind the numbers. The summary of pledges we are releasing today provides the most up-to-date information available, and will be updated once all country reports are formally submitted. While there have been no significant changes to the overall pledges, further details are emerging on how the pledged resources are being mobilized and allocated. There have been some concerns over the impact of Japan’s aid cuts and U.S. budget cuts on their respective fast start commitments. These events may have an impact on 2011 and 2012 allocations of these countries, but there have been no formal announcements by either country since these events. The United States, in particular, has never made specific numerical commitments as part of their overall fast start pledge for the period 2010-12, always maintaining that it will contribute its “fair share.” The ambiguity in the overall pledge makes it hard to assess changes resulting from the budget cuts. Moreover, the budget documents do not allow us to accurately estimate the total fast start finance available for 2011. However, it is quite likely to be lower than the $1.9 billion that the administration had requested for FY2011 in early 2010 from the previous Congress, and some unofficial estimates indicate that it will be under $1 billion. Did countries meet their 2010 pledges? Since many countries have not yet made public the resources that they have actually delivered for 2010, it is not possible to provide an accurate overall estimate. However, the updated summary does contain information on actions taken by the executive bodies of some countries. The amount requested and/or budgeted by these bodies totals roughly $12 billion. Some countries have reported more specific information. For example, in November 2010, Germany indicated that it would disburse 356 million euros in 2010, while the UK indicated that it had approved £568 million for specific programs in 2010-11. This means that Germany and the UK will still need to allocate 904 million euros and £932 million, respectively, in fast start funds by 2012 in order to meet their pledges. Since we started tracking fast start pledges over a year ago, voluntary reports by each developed country have been quite varied, making it very difficult to track and monitor progress against the pledges. To ensure clarity, WRI recommends that countries include the following elements in their submissions: the scale of finance provided, the method for determining that the resources provided are indeed ‘new and additional’, the institutions through which they are channeling resources, the objectives, geographic distribution, whether the amount pledged has been allocated or delivered, and the types of financial instruments used. The uncertainty in estimating the exact amount of funds clearly underscores the need for greater transparency and consistency in reporting. Yet what is more important is that the finance is actually delivered at the pace and scale needed to address the growing threat from climate change. We are yet to see this sense of urgency as developed countries continue to teeter in honoring even their modest commitments. Clifford Polycarp is a Senior Associate in the Institutions and Governance Program of the World Resources Institute (WRI). 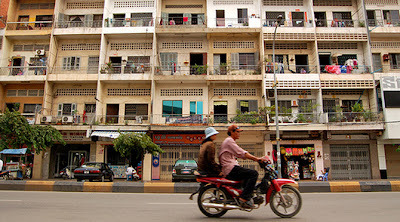 Roaming the streets as a motorcycle taxi driver in Dangkao district on the edge of Phnom Penh, Ek Sovannara is lucky to earn US$ 2.50 a day. But his aspirations once stretched much further. In 2005 he was presented with an opportunity to borrow US$ 500 from Credit Microfinance Institution, a firm established by the Christian charity World Relief US in 1993, to set up a small food stall in Trapaing Krasaing commune where crowds of garment workers pass on their way to work. His decision that day to take the money would stay with him for years. Since then, borrowing more and more from private lenders to pay back microlenders, he has fallen into a complicated web of debt now so severe that he is considering selling his house and about 50 square meters of land, together worth around US$ 6,000. Though he has managed to pay back some of what he borrowed, his business ceased turning a profit two months ago. After successive borrowing to repay other loans, Sovannara still owes US$ 1,520 to Credit Microfinance Institution and a further US$ 400 to seven private moneylenders. Sovannara, 39, is far from alone in his battle with debt. From its nascent days in the mid-1990s, Cambodia now has more than a million families with a microcredit loan in a population of 14 million people. That number is growing fast. Total outstanding loans as of the end of the first quarter amounted to US$ 711.8 million, an almost 10 percent increase over the previous quarter. Like many others in his village, he has been approached by both private moneylenders and licensed microfinance institutions that hand out small loans with few strings attached, offering anywhere between US$50 and US$2,000. Private lenders often allow borrowers to pay back the formal lenders, who in return agree to provide their clients with more credit. A lack of available credit history has also produced cases where clients have taken loans from more than one microfinance institution at the same time. It is hard to know if this scenario is representative of the broader microcredit sector. Only licensed microfinance institutions are obliged to report on loan defaults, while smaller, registered institutions do not. According to figures from the Cambodia Microfinance Association, non-performing loans among licensed institutions were calculated to be just 0.99 percent in the first three months of the year. Defaults on loans appear to be even lower. At Chamroeun Microfinance, defaults on loans amounted to just 0.01 percent in 2010 while at Hatta Kaksekar Ltd, which started offering micro-loans as an NGO in 1994 and became a licensed MFI in 2004, defaults on loans was just 0.2 percent in 2010. Microfinance institutions "have invested in improving systems and there are higher levels of control than before," said John Brinsden, vice president of Acleda Bank, the country's largest microcredit lender. He added that commercial banks in Cambodia were beginning to look at many licensed institutions as "serious peers" in the financial services industry. Nonetheless, microfinance institutions admit that loan officers need more training to assess borrowers' creditworthiness and analysts say high levels of debt are a growing problem. As Cambodia's microfinance sector has established itself, particularly over the last five years, a plethora of institutions have flooded into the market. Meanwhile dozens of non-governmental organizations and private moneylenders have also sought a piece of the action. "In difficult times I took money from private moneylenders to pay back the loans I borrowed from the microfinance institutions," said Sovannara, who now relies on his wife’s job in a nearby garment factory as well as his meager income from the motorcycle taxi service. "I feel scared I will lose my home as so many people in my village lost their house to debt problems." The scenario being played out in Sovannara's village in Trapaing Krasaing commune—a tight-knit community where strife in the quest to earn a living is shared—is at times dismal. Both poverty and crippling debt levels loom over the heads of many here. By day, credit officers from some of Cambodia's 27 licensed microfinance institutions travel round on motorbikes looking for new clients and collecting outstanding debts. While acknowledging instances of high debt levels, those in the industry say that most microfinance institutions are largely healthy and have stringent policies on only handing out loans to those with viable incomes. Still, Chan Mach, general manager of Credit Microfinance Institution, which has a loan portfolio of US$35 million in micro-loans, making it the country's fifth largest microcredit institution, said he was aware of the problems facing the microfinance sector. Conference in Phnom Penh on April 24. ﻿﻿﻿﻿Prime Minister Nguyen Tan Dung and his Cambodian counterpart Samdech Hun Sen co-chaired the second Vietnam-Cambodia Investment Promotion Conference in Phnom Penh on Sunday. “The second Vietnam-Cambodia Investment Promotion Conference is significant and necessary for the current period as the event will serve as a channel for regular information exchange between the two countries and business circles,” Dung said. Dung, who was on a two-day visit to Cambodia that wrapped up Sunday, praised the outcomes of economic and trade cooperation attained by the two countries after the first conference, describing them as the foundation for the two sides to further cooperation and tap their potential effectively. “The Vietnamese government resolves on encouraging and creating favorable conditions for its businesses to invest in other countries in general, and in Cambodia in particular,” Dung told the participants, who also included 200 businesses from both countries. Taking the floor, Cambodian PM Hun Sen underlined the importance and significance of the conference. He pledged the creation of a profit-making environment, noting the Cambodian government is pressing ahead with reforms in several areas to facilitate trade and investment in the fields it boasts high potential, such as telecom, rubber tree planting, mining, and hydropower. Representatives from the Development Council and the Chamber of Commerce of Cambodia introduced to the conference their country’s economic development strategy together with its key areas and investment promotion policies and repeated the Development Council’s commitments to Vietnamese investors in Cambodia. Over the past years, the friendship and all-sided cooperation between Vietnam and Cambodia has been deepened. The two countries have signed over 60 legal documents on bilateral cooperation in almost all fields and created necessary cooperative mechanisms to fit their current development requirements. As a result, economic and trade ties between the two countries have grown steadfastly. The two-way trade value has increased year on year, from US$950 million in 2006 to hit over $1.8 billion in 2010. Realizing their advantages and disadvantages, the two sides have also proactively discussed measures to boost economic and trade cooperation, including the opening and upgrade of several border economic zones and border markets. Vietnam has to date had 87 invested projects with a total capital of over $2 billion in Cambodia, ranking third among foreign investors there. These projects are mostly engaged in telecom, aviation, agriculture, rubber tree planting, energy, hydropower, mining and banking. At the end of the conference, the two PMs witnessed the signing of memorandums of understanding on investment promotion and management between the Ministry of Planning and Investment of Vietnam and the Development Council of Cambodia. They also witnessed the hand-over of investment licenses to the Lower Se San 2 hydropower project and the iron ore mining project between the Vietnamese Ministry of Industry and Trade and the Cambodian Ministry of Industry, Energy and Mining. Earlier, the two PMs cut the ribbons to launch the Vietnam-Cambodia Securities Company. 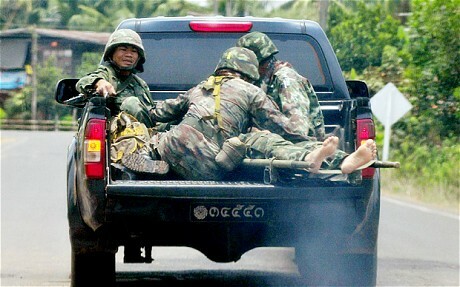 Indonesia's foreign minister "indefinitely" postponed a round of shuttle diplomacy to Thailand and Cambodia on Monday aimed at brokering a ceasefire in the neighbours' bloody border clashes that have left 12 soldiers dead. At the last minute Marty Natalegawa cancelled a planned visit that was to take in Bangkok and Phnom Penh to discuss ending the four days of fighting around two 12th century temples in a disputed border area littered with landmines. The bitter fighting is the worst since trouble flared along the disputed border three years ago. Tens of thousands of people on both sides were sent fleeing for the safety of makeshift shelters, leaving villages like ghost-towns. 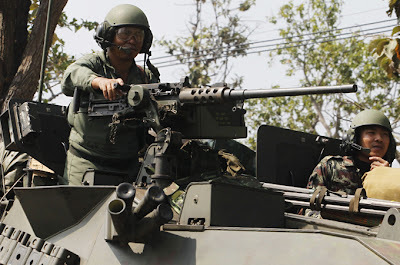 The latest round of fighting comes after Indonesia as the chair of the south-east Asian ASEAN bloc – of which Thailand and Cambodia are both members – brokered a truce to deadly skirmishes in February. Indonesian troops were due to travel to the scene of February's fighting around the UN World Heritage Preah Vihear temple to act as ceasefire monitors, but the Thai army blocked their arrival. Bangkok has consistently pushed for bilateral talks to resolve the dispute with Cambodia, while Phnom Penh has said only outside help can orchestrate an end to the repeated clashes. 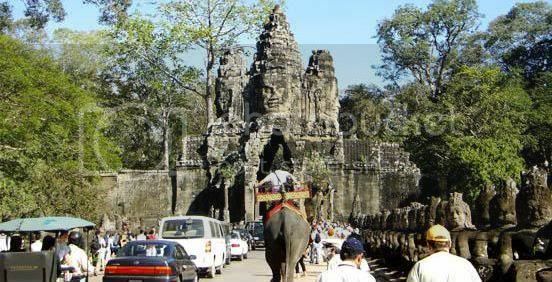 The new outbreak of hostilities erupted on Friday near the Ta Moan and Ta Krabey Hindu temples, about 90 miles to the east of February's fighting. After a lull during much of Sunday it reignited in the evening and continued into Monday morning, leaving one soldier dead on each side. Cambodia has accused Thailand of damaging the two temples with artillery fire and shooting shells up to 20 miles inside its territory. Seventeen thousand villagers have moved to safe areas on the Cambodian side, while 30,000 Thais have sought shelter away from the fighting. It is not immediately clear what sparked the latest round of fighting, but both sides have in the past used the emotive territorial issue to stoke nationalist fervour. Analysts point to the fact that with an election due in Thailand before July, the fighting could bolster support among hard-line nationalists for prime minister Abhisit Vejjajiva's government, which faces an uphill task to win re-election. At least 14 people killed as fighting spreads in the disputed Dangrek mountains, home to several ancient temples. Fighting continued for a sixth day between Thai and Cambodian troops on Wednesday in an area near three disputed 12th-century temples, as talks between the two sides appeared to collapse. Dangrek mountains within the past week, and 50,000 have arrive at evacuation centres. The latest fighting began at 5am, and was continuing more than four hours later - with heavy shelling near the Ta Moan and Ta Krabey temples, Cambodia's defence ministry said. Thai defence minister Prawit Wongsuwon had been expected to meet his Cambodian counterpart, Tea Banh, in Phnom Penh on Wednesday - but reportedly pulled out of the trip because of alleged comments made on Cambodian TV. "We decided last night to cancel General Prawit's trip to Phnom Penh today after some Cambodia media reported Thailand agreed to ceasefire talks after it admitted defeat and losses," army spokesman Colonel Sunsern Kaewkumnerd told Reuters. "We welcome talks on the condition that they stop firing first for a few days. 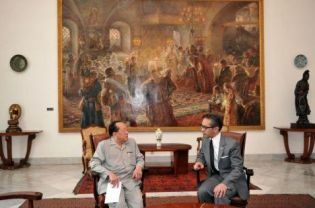 We clearly informed Cambodia of this condition," Sunsern said. Cambodian government spokesman Phay Siphan responded by saying Thailand "isn't honest about wanting to reach a permanent ceasefire". The bloodiest fighting along the disputed jungle border in decades has spread to the 900-year-old Preah Vihear temple, the focus of strained relations between the neighbours since it was granted UN World Heritage status in 2008. The area, 150km east of two other disputed temple complexes that were the scene of fierce fighting over the weekend, had been relatively calm for two months. East Asian Nations foreign ministers in Jakarta in February. Sovereignty over the ancient, stone-walled Hindu temples - Preah Vihear, Ta Moan and Ta Krabey - and the jungle of the Dangrek Mountains surrounding them has been in dispute since the withdrawal of the French from Cambodia in the 1950s. Scrambling to take advantage of the EU’s Everything But Arms (EBA) treaty, which allows duty-free, quota-free access to Europe for Cambodian goods, Cambodia’s agro-barons are trampling human rights underfoot, according to campaigners. Western companies have been accused of being complicit, seeking out the cheapest sugar, whatever the consequences. Bridges Across Borders Cambodia published a report in September 2010 into the situation, citing forced evictions, seizure and clearance of farmers’ land and crops, destruction of forests, poisoning of local water resources and fisheries, arrests, and harassment of human rights defenders, all connected to the sugar sector. One compelling example of the damage sugar can do are concessions linked to Ly Yong Phat, a Cambodian senator, agribusiness baron and casino-tycoon. The litany of allegations is staggering, even by Cambodian standards. Testimonials from villagers affected by a 9,400 hectare Ly Yong Phat concession in Koh Kong province’s Sre Ambel district, held under a company named Koh Kong Sugar Co., speak of their desperation. Cheav Ean, 64, is one of the over 200 families from three villages now living with the consequences of the nearby sugar cultivation. She claimed that she had lived on her land since 1975, making it her legal property under Cambodian law. Nevertheless, she claims that she lost 11.5 hectares to Ly Yong Phat’s concession without any compensation, encroachment that has seen her herd of around 40 cattle dwindle to five as she has been forced to sell livestock to make ends meet. Many Cambodians are farmers and rely on their smallholdings for survival. Mostly poorly educated and often illiterate, villagers can be at the mercy of the authorities or powerful businessmen, especially if they have never legally registered their land with the central administration. Local officials reportedly in cahoots with land grabbers can betray those they are supposed to represent, tricking the most vulnerable out of their land and leaving them with nothing, campaigners claim. Teng Kao, 48, says that he lost 14.5 hectares he had occupied for 20 years to the Koh Kong Sugar concession. He also claimed that residents’ land had been recognised by local commune authorities, who issued documents. Instead of recognising villagers’ ownership and compensating them however, the widower and father of six claimed that villagers’ had been subjected to a campaign of intimidation, with cattle seized for ransom. He said that two of his cows had been shot and killed. On 19 April, the project’s future will be decided. It is slated for construction in a remote area in northern Laos and is expected to provide power to Thailand. 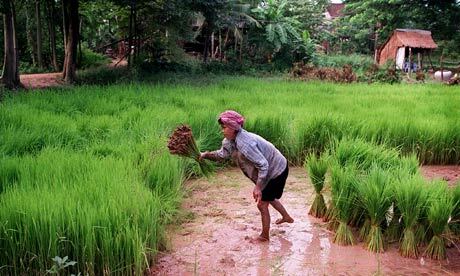 Environmentalists and Vietnamese authorities oppose the plan; 263 NGOs from 51 different nations are also against it because it could damage plant and animal life and jeopardise Vietnam’s rice production. Bangkok (AsiaNews/Agencies) – A summit in Vientiane, capital of Laos, on 19 April will decide the fate of Xayaburi dam in the presence of Laotian, Thai, Vietnamese and Cambodian representatives. Meanwhile, environmentalists continue their struggle against the project, which could cause very serious damages to the natural ecosystem and change the balance of the most important Southeast Asian river. The US$ 3.5 billion, 1.260-megawatt hydroelectric dam project is slated for a remote region of northern Laos, and would force the resettlement of up 2,100 villagers and affect tens of thousands of people. A Thai firm would build the dam, and Thailand would be the main beneficiary. The summit in Vientiane on 19 April should seal the fate of the project, which could get the green light, get the axe or be temporarily suspended waiting for the conclusions of an environmental impact study. Opponents of the project say it would set a precedent and allow the construction of ten more dams on the lower Mekong. Local officials and environmental experts warn that three dams build up river, in Chinese territory, have already taken a heavy toll on the river’s ecosystem. The “Xayaburi dam will bring more suffering,” they said. Environmentalists argue that such a dam would disrupt fish migrations, block nutrients for downstream farming and even foul Vietnam's rice bowl by slowing the river's speed and allowing saltwater to creep into the Mekong River Delta. 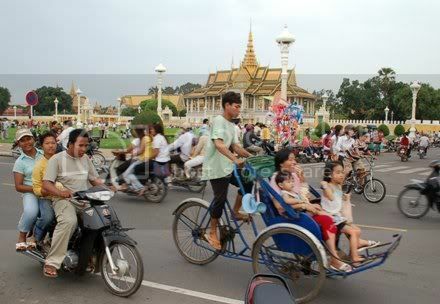 Hanoi is in fact opposed to the project and for the first time has taken on Laos’ Communist government. Last month, 263 NGOs from 51 countries sent letters to the governments of Laos and Thailand urging the project be shelved. However, Laos in February said that the Xayaburi dam would be the "first environmentally friendly hydroelectric project on the Mekong" and that it would "not have any significant impact on the Mekong mainstream." Scientists have called for its construction to be delayed for 10 years until more research is conducted. A study by the Mekong River Commission (MRC) released in February warned that dams could reduce the fishery by 300,000 tonnes a year, with serious consequences for a million people, especially in Cambodia, who depend on fishing. It too recommended a ten-year moratorium to better study the consequences of the project. About 65 million people live along the Mekong River, which starts on the Tibetan plateau and flows through China’s Yunnan province before making its way to Myanmar, Thailand, Laos, Cambodia and Vietnam, which all depend on it economically. The value of the fishery and fish farming has been estimated at around US$ 3 billion a year. Now the 4,880-kilometre waterway, considered to be the second most bio-diverse river in the world, is threatened by hydroelectric dam projects, like the Xayaburi dam, which Laos has presented to the MRC. As the governments of Laos, Thailand, Cambodia, and Vietnam ready to meet on April 19th to decide whether or not to move forward on the Xayaburi Dam, critics of Mekong River hydroelectric project have warned that the dam will devastate freshwater biodiversity and impact the livelihoods of hundreds of thousands, if not more. Last month a coalition of 263 organizations from 51 countries released a letter in opposition of the dam’s construction. "As a river of global significance, we are urging the Governments of Laos and Thailand to call a stop to the destructive Xayaburi Dam,” said Pieter Jansen of Both ENDS, an international NGO and member of the coalition. “If the project proceeds, the [Mekong River Commission's] regional decision-making process will lose all public credibility. " The $3.5 billion Xayaburi dam would be built in Laos, but largely bring power to Thailand. In total 2,100 people will have to be moved to make way for the dam, but according to critics the dam will impact nearly a quarter of a million people. Local fisheries are likely to be hard hit while environmentalists warn that the dam could lead to the extinction of dozens of species of fish, including the Critically Endangered Mekong giant catfish (Pangasianodon gigas). A rare giant, specimens have been caught weighing up to 600 pounds (270 kilograms). The river may also block essential nutrients for farming from making their way downstream. 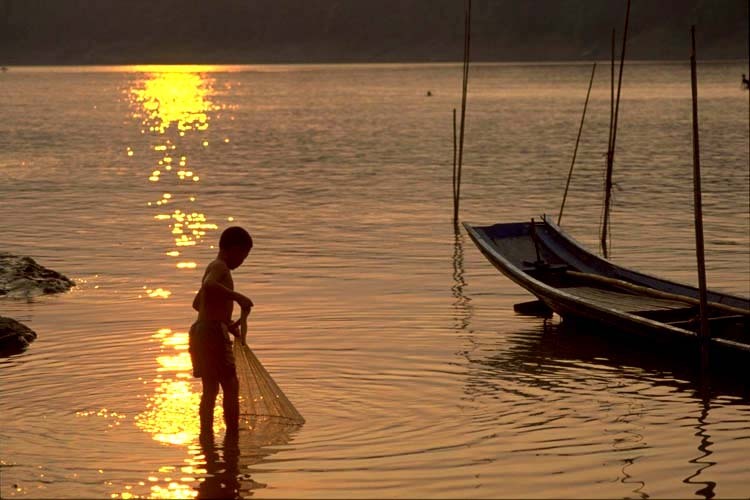 Researchers say the Xayaburi Dam on the Mekong would hit fishermen hard. 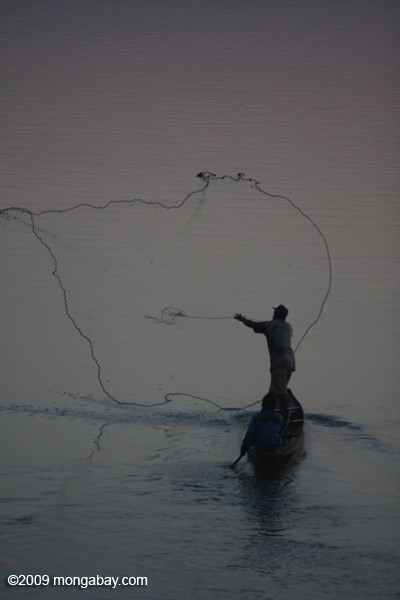 Here, a man fishes at dawn on the Mekong River in Laos. Photo by: Rhett A. Butler. "The Xayaburi Dam will trigger an ecological crisis of tremendous proportions. We urge the Prime Ministers of Laos and Thailand to show leadership by cancelling this project," said Shalmali Guttal of Focus on the Global South, another member of the 253 coalition against the dam. For its part, the Laos government, which is pushing the project, has said the dam will be the "first environmentally friendly hydroelectric project on the Mekong" and would "not have any significant impact" on the river. Researchers and environmentalists have asked for a ten-year delay to conduct better studies on the dam's impact, a view that US Secretary of State Hillary Clinton shared when visiting the region. Cambodia, whose people stand to lose the most in fisheries, has also recommended a delay, while Vietnam has come out against the project, essentially splitting the four deciding nations. Local protests have also proven lively with thousands of people who make their life along the Mekong showing up in opposition against the megadam. "Our lives and livelihoods depend on the health of the Mekong River," Kamol Konpin, mayor of the Thai riverside town of Chiang Khan, told the AP last week. "As local people have already suffered from dams built upstream in China and watched the ecosystem change, we are afraid that the Xayaburi dam will bring more suffering." In an age of worsening climate change, massive hydroelectric projects have become increasingly popular in many parts of the world—from the Belo Monte in Brazil to the Gibe III in Ethiopia—as a way to meeting rising energy needs. However large-scale dams come with their own sets of problems, including human displacement, decline in fisheries, loss of livelihoods, and ecological destruction. Beyond that studies have also shown that dams are not as 'climate friendly' as proponents claim, especially not in the tropics. Dams on tropical rivers have been shown to release massive amounts of the methane, a greenhouse gas 25 times more potent than carbon dioxide in a 100-year timescale. In some cases tropical dams may release more greenhouse gases than fossil fuel powered plants. The role of social networking site Facebook in facilitating protest actions has been affirmed in the Tunisia and Egypt uprisings; governments in many countries, including China, are wary of the political activities of their citizens on Facebook. But in Cambodia, Facebook is not yet considered a threat by the government. Politicians led by Prime Minister Hun Sen (who has been in power since 1985) have created their own Facebook pages where they interact with Cambodian citizens and netizens. There is however, a newer and interesting Facebook trend in the country: Cambodians are creating songs about Facebook. For example, 'Facebook ends love‘, uploaded to YouTube by user lotusresortandspa on March 11, 2011. It seems a bit surprise when I hear the song but it might be true somehow. He stated in the song that since there’s Facebook, his girlfriend seems not to take care of him like before. He felt like he is totally abandoned. His girlfriend spent her time to connect with different people via Facebook. This of course could cause a serious effect in the relationship. In Cambodia, there are only about 250,000 Facebook users accounting for 1.73% penetration rate in the country, according to socialbakers.com. But with politicians endorsing Facebook and artists creating songs about the popular social networking site, Facebook will definitely attract more users in Cambodia. Written by Sopheap Chak and originally posted to Global Voices. PHNOM PENH, April 10 (Reuters) - Cambodian authorities began an investigation on Sunday into the mass fainting of about 800 workers at two garment factories, including one that produces footwear for German sporting goods group Puma . 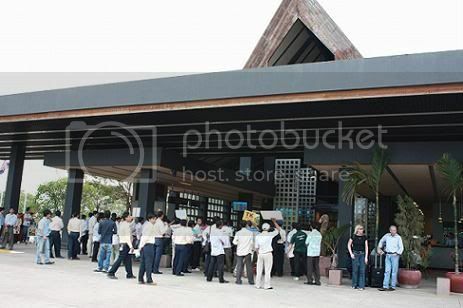 another 500 on Sunday at Universal Apparel (Cambodia) Co Ltd, labour industry officials and workers said. Huey Chuen supplies products to Puma. Puma, quoting a local police report, said the number of Huey Chuen workers who fell sick was 101. Moeun Tola, head of the labour unit at the nonprofit Community Legal Education Center, put the figure at about 300 and said the discrepancy was due to large numbers of workers going home instead of to hospital. "I was just feeling exhausted and dizzy," said Keopich Panha, a hospitalised 19-year-old shoe stitcher at Huey Chuen. Phnom Penh Police Chief Touch Naruth told Reuters his officers and the Labour Ministry were investigating the factories, where workers such as Keopich Panha typically earn about $61 a month. "It could have been the workers were too tired. We will also look at work environment issues and whether there was enough air or oxygen," he added. "We don't know the conclusion yet." Worker Soeum Ny, 24, said the smell from materials used in the manufacturing of sport shoes may have made workers sick. "We are used to it now. This affects our health but there is nothing we can do," she said. Moeun Tola said mass fainting is a problem in Cambodia's textile industry because rules requiring factories to be monitored are not enforced. "The government has to strictly monitor these factories," Moeun Tola said. Garment manufacturing is Cambodia's third-biggest currency earner after agriculture and tourism. More than 210,000 textile workers went on strike last year over the government's attempt to regulate trade unions. A surprising reversal has made environmentalists and animal welfare advocates ecstatic. In February, the Cambodian government approved the construction of a huge titanium mine in the middle of the Southwest Elephant Corridor in the Cardamom Mountain rainforest in Cambodia. This area is home to more than 100 endangered Asian elephants and many other endangered and at-risk species. Prime Minister Hun Sen reversed his February agreement with the United Khmer mining group and has denied permission to continue with the titanium mine. A press release Friday morning said: "Due to the concerns of the impact on the environment, biodiversity and local livelihoods [Prime Minister] Hun Sen has announced to not permit the titanium mining operation that is located in Koh Kong province." Over 90,000 Care2 members signed two petitions advocating for the protection of this rainforest and the precious animals that live there. Things were not looking hopeful in February, but we are so excited to say that all of the hard work and involvement of our members and Wildlife Alliance has paid off. "We are elated by the decision of Prime Minister Hun Sen. It is incredibly encouraging to see that the prime minister has looked so deeply into this proposed titanium mine and taken the effort to weigh the consequences that this project would have on the rainforest and the local people," said Wildlife Alliance CEO Suwanna Gauntlett. "United Khmer Group had promised staggering revenues for the government, and we applaud the courageous decision of the prime minister to see the greater value of the forest as it currently stands." Thanks for remaining hopeful and continuing to fight for Cambodia's Cardamom Mountains and all of the species who call this rainforest their home. The Ministry of Information called yesterday for the independent Beehive Radio station to cease broadcasting the Khmer Post programme or face legal action. In a letter dated yesterday, Information Ministry Secretary of State Uk Prantha told Beehive Radio Director Mam Sonando that he had violated government policy by not seeking permission before broadcasting the Khmer Post radio show. The show, which is not affiliated with The Phnom Penh Post, began last week and discusses politics and current affairs, frequently criticising the government. “The Ministry of Information warns you for the last time and requires you to immediately stop renting broadcast hours on Beehive Radio to Khmer Post Radio,” the letter states. broadcasting department at Information Ministry, said it was “the principle of the Ministry of Information that the renting of broadcast hours must be done with permission”. Mam Sonando could not be reached for comment yesterday, though Meach Sovannara, director of Khmer Post Radio, said he was concerned that the move could be politically motivated. “If they do not allow us [to broadcast], it is the intention of the Information Ministry and the government to close down freedom of expression,” he said. Pa Nguon Teang, director of the Cambodian Centre for Independent Media, said the Information Ministry’s directive was “illegal” and that there was “no law” to justify it. Mam Sonando was arrested in 2005 and charged with defamation, disinformation and incitement in connection with a Beehive Radio broadcast in which a guest criticised the border demarcation process with Vietnam. The arrest came amid a crackdown on political speech that also saw Pa Nguon Teang and others taken into custody, though they were released in January 2006 and the complaints against them were eventually dropped. Thir Kruy, secretary of state at the Ministry of Health, speaks yesterday in Phnom Penh. The circulation of counterfeit and substandard drugs is stifling efforts to combat infectious diseases in the Kingdom, government officials and health experts said yesterday. Dr Margaret Chan, director-general of the World Health Organisation, said in a statement released at the World Health Day conference to Combat Drug Resistance in Phnom Penh, that the misuse of antimicrobial medicines such as antibiotics, antivirals and antimalarials is a leading cause of drug resistance. “This includes a failure to keep substandard products off the market, to ensure that antimicrobials are dispensed only by a licensed prescriber, and to stop over-the-counter sales of individual pills,” she said. Antimicrobial resistance – or drug resistance – can cause bacteria, viruses and some parasites to withstand attacks from certain medicines. Dr Pieter van Maaren, country representative for the WHO, said at the conference that the organisation needed to work with law enforcement agencies to combat the sale of counterfeit medicine. Heng Bun Keat, director of the food and drug department at the Ministry of Health, said that only 0.5 percent of drugs sold in Cambodia are counterfeit drugs. 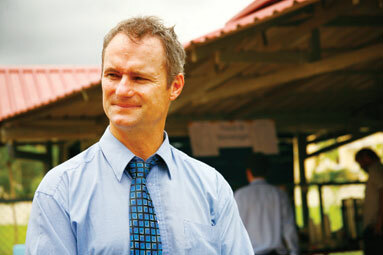 “In late 2009, there were 1,402 unlicenced pharmacies in Cambodia,” he said. Thir Kruy, secretary of state at the Ministry of Health, said that buyers and patients are not aware that illegal drugs have different effects to legal drugs. A study initiated by the Ministry of Health in 2006 and released last October by the National Health Product Quality Control Centre and researchers in Japan, estimated that an average 2.9 percent of drugs sold through licenced outlets in Cambodia were counterfeit. WHO representatives yesterday announced a six-point plan for combating drug resistance, which encourages countries to establish a national plan to strengthen surveillance and laboratory capacity, to increase access to quality medicines and promote proper use of medicines, to prevent and control infection and to invest in research and development. JSM Indochina’s Phnom Penh properties have been sold to a regional firm for US$33.7 million, in what industry insiders called the first large post-crisis real estate transaction in the Kingdom. The deal, which includes the Embassy Centre property near Wat Phnom, its two Colonial Mansions and the Ounalom property near the riverside, is expected to close within six months, according to the buyer. “We see this as an excellent opportunity for Hongkong Land to enter the Cambodian property market, which we believe offers great growth potential,” said Robert Garman, executive director, South Asia, of Hongkong Land Ltd.
JSM Indochina hired international property firm CB Richard Ellis to sell its five Cambodia and four Vietnam properties in September, 2010, after an April vote by JSM shareholders to cash in on its portfolio. In October, JSM said the conditions of Cambodia’s real estate market were “challenging”, adding the “expected response from potential foreign buyers has been less robust than hoped”. Yesterday, CB Richard Ellis Country Manager Daniel Parkes said the rebounding Cambodian real estate sector made purchases attractive. The $33.7-million price tag represented the market value of the transaction, he said. National Valuers’ Association of Cambodia President Sung Bonna agreed the sale price for the four JSM properties was reasonable. “So far since the crisis happened, this is the first big investment in property,” he said. 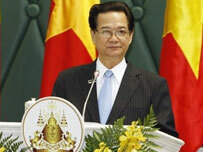 He described it as a “good sign” of growth in a sector that has lagged the Cambodian economy in recovering. Sung Bonna said it would be “a few years” before Cambodia’s real estate market fully recovered from the downturn, but that it would most likely not reach levels seen just before the crisis. Lao Tip Seiha, director of the Construction Department at the Ministry of Land Management, Urban Planning and Construction, said he was not aware of the deal’s specifics, but claimed foreign investors were feeling increasingly confident about the sector. Projects approved for construction lifted by an annualised 53 percent over the first two months of 2011, he said. 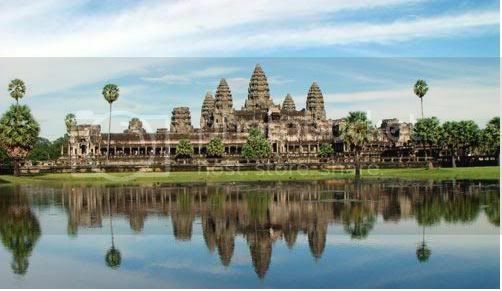 JSM said yesterday it was in “advanced discussions” with Hongkong Land regarding a potential sale of its leasehold interest in Siem Reap. Hongkong Land International Holdings, the buyer’s parent, is a member of Jardine Matheson Group. A Jardine’s holding firm is 12.25 percent owner of ACLEDA Bank, among other interests in Cambodia. or Cryptelytrops cardamomensis, is seen in an undated photo. Cambodian forests are a potential haven for undiscovered animal species, highlighted by the recent discovery of a new type of pit viper, yet scientists claim illegal logging and environmental hazards threaten the Kingdom’s biodiversity. 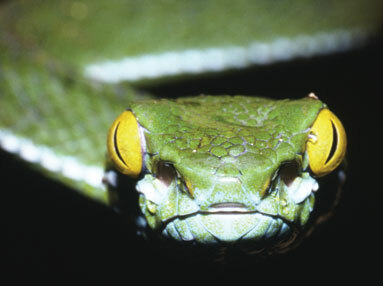 Dr Anita Malhotra, a professor at Bangor’s School of Biological Sciences in South Wales, United Kingdom, said yesterday that Cambodian forests “almost certainly hold the potential for a wide variety of undiscovered species” after her students were part of a research team that discovered the green pit viper in the Cardamom Mountains. The discovery, announced last week, was made by a team led by Bryan Stuart, an amphibian and reptile curator at the North Carolina Museum of Natural Sciences, who has been researching in Southeast Asia for more than 12 years. “All pit vipers are venomous. However, we have little knowledge of how dangerous [this snake] is to humans. 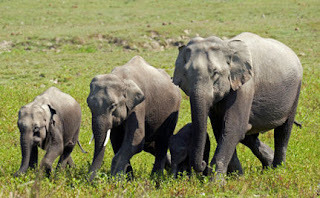 “Extrapolating from closely related species, it is likely to cause pain and swelling, perhaps some local tissue damage around the site of the bite, but is unlikely to cause death,” said Dr Malhorta. She said that the discovery highlights the need to protect Cambodia’s natural habitats, especially as this particular species of snake could yield new advancements in the field of medicine. “Identifying these species is the first step towards protecting them: it means that people know what is out there to protect,” she said, adding that researchers are continuing to work to find new species in the country. According to Conservation International, the Indo-Burma biodiversity hotspot, which encompasses Cambodia and more than 2 million square kilometres of tropical Asia, has less than 5 percent of its original forest remaining in a pristine state largely because of the damage done by illegal logging and other environmental hazards. “The remaining fragments are hugely significant as refuges for the biodiversity contained in this region and any further destruction will consequently have much larger repercussions,” said Dr Malhotra. Former Olympic rower Rob Hamill has announced plans to file a civil party application at the Khmer Rouge tribunal in relation to the court’s controversial third and fourth cases. The New Zealander’s application targets former Khmer Rouge navy commander Meas Muth and air force commander Sou Met, and follows a similar application lodged by local activist Theary Seng on Monday, the first in relation to Cases 003 and 004. These cases, still in the preliminary investigation stage, feature five suspects who have not yet been arrested or charged and whose identities remain confidential. Theary Seng said this week, however, that she was confident Meas Muth and Sou Met were among those being investigated based on public documents and her own research. Hamill’s brother Kerry was captured by the Khmer Rouge in 1978 while sailing with friends in the Gulf of Thailand before being taken to S-21 prison in Phnom Penh and executed. Rob Hamill appeared to testify about the ordeal in 2009 during the tribunal’s first trial, that of former S-21 prison chief Kaing Guek Eav, better known as Duch. Speaking by phone from New Zealand, Rob Hamill said yesterday that his new civil party application had been inspired by Theary Seng’s, and that he hoped it would help end “the stalling of the process” in Cases 003 and 004. Prime Minister Hun Sen and other Cambodian officials have expressed opposition to these cases, which have apparently progressed little since they were first submitted for investigation by prosecutors in 2009. “The experience of the court I’ve found very rewarding, and from a moral perspective, I think it’s been a great process to go through, with the exception of this last case,” Hamill said. Tribunal officials reacted angrily to Theary Seng’s announcement this week, declining to confirm whether Meas Muth and Sou Met are indeed being investigated and calling the allegations “reckless” and “irresponsible”. United Nations court spokesman Lars Olsen said yesterday that the court “has already said publicly what its reaction is to the naming of individuals in the public domain”. “I find it unfortunate that it seems like a practice of naming individuals based on speculation is continuing by another civil party applicant,” Olsen said. Both Hamill and Theary Seng, whose loved ones were killed under the Khmer Rouge regime, said in statements this week that they held Meas Muth and Sou Met responsible for the deaths of their family members, for the role the men played in the “common purpose and design in the arrests and executions, specifically in their respective divisions and generally for the whole of Cambodia”. Hamill said yesterday that Meas Muth bore particular responsibility for the death of his brother, who was captured by the Khmer Rouge navy. “I see Meas Muth’s role as critical, almost potentially more important than the role Duch played, in the sense that his role … that he played to take my brother’s freedom away was the critical moment in my brother’s life,” Hamill said. Angelina Jolie has had a new tattoo tribute to Brad Pitt. The actress has the co-ordinates of the birthplaces of her six children - Cambodia for nine-year-old Maddox, Vietnam for seven-year-old Pax, Ethiopia for Zahara, six, Namibia for four-year-old Shiloh, and France for two-year-old twins Knox and Vivienne – tattooed on her arm and sparked speculation she and her partner were adopting again after she added a seventh line to the inking. However, it has now been claimed the new body art is the longitude and latitude of Brad's Oklahoma birthplace. A source told InTouch Weekly magazine: "She got the seventh line right around the time she and Brad moved the kids back to Los Angeles. It signified family unity." Angelina already has another tattoo tribute to Brad – the words Whiskey Bravo on her inner thigh. Quizzed about the inking, she said recently: "Ohh, it's for Brad. It is something for Brad." In the military alphabet, Whiskey Bravo represents the letters W and B, the initials of the actor, whose real first name is William. The 35-year-old screen beauty has more than 14 tattoos, including a letter M in tribute to her late mother Marcheline Bertrand, and a lower case j in honour of her brother James. during their meeting at the State Palace in Bogor on Friday. Cambodian Foreign Minister Hor Namhong on Saturday expressed disappointment over Thailand’s refusal to send Indonesian military observers to the disputed Thai-Cambodia border. “If Thailand wishes really to have a ceasefire at the border, why should they hesitate to receive Indonesian observers,” he told reporters in Jakarta ahead of an Association of Southeast Asian Nations (Asean) meeting on the relief response to tsunami-ravaged Japan. 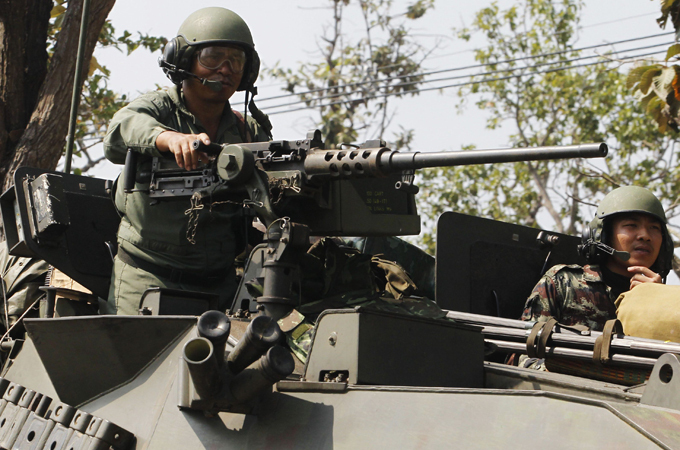 “Every time there’s an armed clash, they always accuse Cambodia of starting the fighting. In such a case, why don’t they accept [the] role of Indonesia as mediator?” he added. At an Asean meeting in February, Thailand and Cambodia agreed to accept Indonesian observers to a flashpoint section of the border where heavy fighting erupted the same month. But Thailand’s military in March said the observers were not wanted in the disputed area near an 11th-century temple because it was too dangerous and they would only complicate matters. Hor Namhong said Thailand ought to respect Indonesia’s role in the border negotiations as Jakarta had received the UN Security Council’s support. “We have to respect the Asean chair’s role in the negotiation. Indonesia as a chair has received the mandate from the UN Security Council,” he said. “I never can be optimistic with Thailand, it’s very difficult to deal with them... I always trust Indonesia,” he added. A two-day border meeting of senior officials from the two countries held in Bogor, West Java province, this week ended without resolution. “The border issue is very complex. The discussion process cannot possibly be solved in just one meeting,” Indonesian Foreign Minister Marty Natalegawa told reporters on Friday. Thailand and Cambodia have each accused the other of starting the border clashes, which erupted around the ancient Hindu temple of Preah Vihear. BANGKOK (AP) — A plan for the first dam across the Mekong River anywhere in its meandering path through Myanmar, Laos, Thailand, Cambodia and Vietnam has set off a major environmental battle in Southeast Asia. The $3.5 billion Xayaburi dam is slated for the wilds of northern Laos and would generate power mostly for sale to Thailand. The project pits villagers, activists and the Vietnamese media against Thai interests and the Laotian government in its hopes of earning foreign exchange in one of the world's poorest countries. A decision on whether the dam gets the green light, is axed or deferred for further studies is expected April 19 during a meeting in the Laotian capital among Laos, Thailand, Vietnam and Cambodia. Opponents warn it could open the way for 10 more dams being considered along the lower Mekong. "Our lives and livelihoods depend on the health of the Mekong River," said Kamol Konpin, mayor of the Thai riverside town of Chiang Khan. "As local people have already suffered from dams built upstream in China and watched the ecosystem change, we are afraid that the Xayaburi dam will bring more suffering." China has placed three dams across the upper reaches of the Mekong, but otherwise its 3,000-mile (4,900-kilometer) mainstream flows free. The Xayaburi would cut across a stretch of the river flanked by forested hills, cliffs and hamlets where ethnic minority groups reside, forcing the resettlement of up 2,100 villagers and impacting tens of thousands of others. Environmentalists say such a dam would disrupt fish migrations, block nutrients for downstream farming and even foul Vietnam's rice bowl by slowing the river's speed and allowing saltwater to creep into the Mekong River Delta. A Thai firm would build the 1,260 megawatt hydroelectric project. However, Thai villagers along the river are staging protests and planning to deliver letters to Thai Prime Minister Abhisit Vejjajiva and the Lao Embassy in Bangkok, where the Thai government has maintained an official silence on the issue. Pianporn Deetes, of the U.S.-based International Rivers, said environmentalists are ready to take their case to court if Abhisit doesn't deliver a positive response. Last month, 263 non-governmental organizations from 51 countries sent letters to the governments of Laos and Thailand urging that the project be shelved. Laos said in February that the Xayaburi would be the "first environmentally friendly hydroelectric project on the Mekong" and that will "not have any significant impact on the Mekong mainstream." "We are excited about this project," the statement said. Vietnam's official media, in a rare disagreement with its communist neighbor, has blasted the dam, while scientists and environmental groups have called for its construction to be delayed for 10 years until more research is conducted. "It seems that countries of the lower Mekong still haven't learned lessons from the impact of the Chinese dams," Pianporn said. 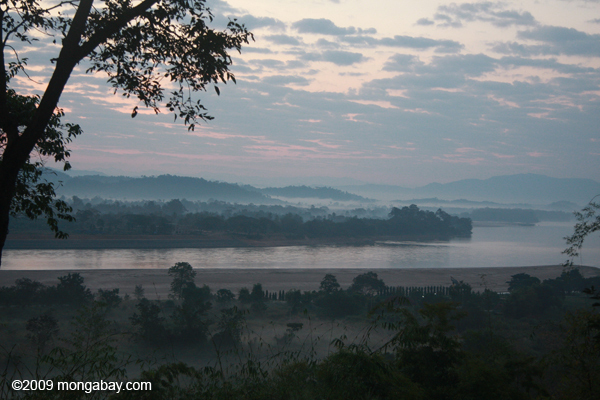 "Xayaburi is so important because it could set off the destruction of the lower Mekong." Since 2007, there have been proposals to put up 11 mainstream dams in Cambodia and Laos. The Mekong River Commission, set up by the four Southeast Asian neighbors in 1995 to manage the river, has expressed serious reservations about Xayaburi. A study by the group recommended a 10-year moratorium on all mainstream dams, a stand supported by U.S. Secretary of State Hillary Clinton during a Southeast Asian trip earlier this year. The commission cited feared damage to migrations of between 23 and 100 fish species, among a host of other environmental problems. Another MRC document showed nobody spoke in favor of the dam during public consultations this year in Vietnam, Cambodia and Thailand, while many officials, academics and residents cited problems or lack of information about the project. No consultation was held in Laos. "If this project goes ahead it would be unimaginably irresponsible," said Ame Trandem of Rivers International. Somkiat Khuengchiangsa, who has spent his life along the river and heads The Mekong-Lanna Natural Resources and Culture Conservation Network, said governments are more interested in the economics of the project than its effect on residents. "Rivers are not the property of nations or groups of people. They belong to all mankind," he said. During the ongoing Ho Chi Minh City Expo 2011 in Phnom Penh, Cambodia, Nguyen Thi Hong, the city People’s Committee vice chairperson attended the inauguration ceremony of the first Satra Supermarket yesterday. The Satra Supermarket, of the Saigon Trading Corporation, is the first supermarket initiative by HCMC enterprises to open in the neighboring country. The 2,000 square meter supermarket, located at 154 Chaychumnas Ward in DuanPenh District, will sell over 2,000 Vietnamese high-quality commodities including chemical and cosmetic items, processed foods, household plastic goods and clothing. The supermarket management has plans to increase the number of commodities to 5,000, making it the main center for the supply and distribution of HCMC goods for both the retail and wholesale markets in Cambodia. On this occasion, Ms. Hong also met with the management of two Vietnamese banks operating in Phnom Penh, the Bank for Investment and Development of Cambodia (BIDC) and the Saigon Thuong Tin Commercial Joint Stock Bank. Ms. Hong expressed her appreciation of the efforts made by the banks in providing excellent service and for creating a favorable environment for Vietnamese exporters in Cambodia. Cambodian civil society groups and international NGOs have condemned a proposed new law that they claim will seriously curtail their activities. Human Rights Watch, Amnesty International, Forum-Asia, Global Witness, the Federation of Human Rights Watch, Christian Aid, VSO and Save the Children, along with Cambodian farmers and indigenous rights groups, are among the organisations calling on the Cambodian government to withdraw the draft law, which will require all civil society groups working in the country to register in order to work, and appears ambiguous over rights to appeal. Local organisations will be required to have a specific number of members, will need to be headed by a Cambodian national, which will exclude refugees from forming an association and send the government annual reports. The organisations are also calling on international donors to publicly express their opposition to the legislation. The groups argue that the proposed legislation contravenes national and international human rights laws, will make NGOs subject to the whim of the government, and will undermine years of work to strengthen civil society. They also question the need for new legislation, arguing that existing laws are sufficient to govern civil society groups. This week, 62 NGOs working in Cambodia wrote to government ministers to highlight their concerns following the publication of the second draft of the bill last month. The first draft was published in December. NGOs claim that their earlier concerns had not been taken on board by the government. The Cambodian government has said the law will allow it to crack down on illegal activities by civil society groups and NGOs operating as a front for terrorist activities. It is understood ministers want the final draft of the law submitted this month, and for it to be passed by the end of the year. In a briefing paper published when the law was first mooted, the Cambodian League for the Promotion and Defence of Human Rights (Licadho) said the law had "nothing to do with crime, terrorism or transparency, but everything to do with political control". "The recent experiences of many other countries which – like Cambodia – lack independent judiciaries and other institutions, have shown that NGO laws are regularly used to stifle criticism of the government by civil society, through such means as restrictive registration requirements and even criminal prosecution," it said. In December, the group said the law "will undermine community development and democratic participation on a broad level, including having a potentially grave impact on the ability of grassroots communities to participate in their own development. There is a high risk that local officials will seek to use the law to suppress 'unwanted' activities by community-based groups or networks and individual community members themselves". In January, 10 Cambodian civil society groups said the law "puts more burdens on civil society, which has been initiated and established through the commitment and willingness of local people". Brad Adams, Asia director at Human Rights Watch, said the law "could too easily be used to refuse registration or close down organisations that serve the public interest". He added: "Over the past 20 years the development of civil society has been one of Cambodia's few enduring achievements. This law threatens to reverse that progress." 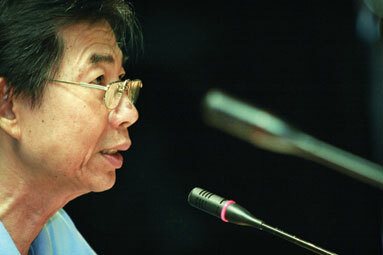 Yap Swee-Seng, executive director of Forum-Asia, said: "When the draft law was first circulated, in December 2010, civil society raised urgent concerns that it would prove vulnerable to abuse by officials at the national, provincial and community level seeking to silence civil society criticism. Far from addressing these fears, the revisions introduced by the government make a bad situation worse." Simon Taylor, director of Global Witness, added: "If donors stand by while the government adopts this law, they cannot in good conscience claim to be working in the interests of Cambodia's development objectives." The international watchdog Freedom House described the proposed law as "fundamentally flawed". "The draft is also vague in scope and contains ambitious language that could make it easier for the government to arbitrarily shut down civil society groups or deny registration," it said. In its Freedom in the World 2010 survey, the watchdog scored Cambodia five out of seven for its record on civil liberties – with one being the most free, seven the least free – saying that critics of the Cambodian People's party, which holds power, faced harassment. In its annual review of human rights practices around the world, published in January, Human Rights Watch said the Cambodian government was making it increasingly difficult for human rights groups, trade unions and land rights activists to operate.